Sportaid presents a comprehensive collection of meaningful and illuminating stories of great achievers. The message is pretty universal: a disability does not define a person. Read and watch these books and videos and get the inspiration you need to take up life’s challenges in the simplest form. Life was never meant to be easy, but you can learn to live yours with passion once you read the Autobiographies of these exalted risk-takers. Browse through our huge selection of Wheelchair Books & Videos below or feel free to call 1-800-743-7203 for help. You'll be glad you did! Get your Wheelchair Books & Videos from Sportaid for savings up to 42% over the competition! Find the Right Wheelchair Books & Videos for You! Beyond The Barriers Video: - Experience the world beyond the barriers with this outstanding new wheelchair video by paraplegic Mark Wellman and other athletes. The team climbs, sails, surfs, dives, and flies into new worlds of freedom. Climbing Back Mark Wellman's Autobiography: - Read the enthralling story of Mark's struggle to survive a disabling climbing accident, and becoming a Park Ranger and an accomplished Wheelchair athlete. His determination and strong will challenges all of us to strive toward higher goals and succeed. 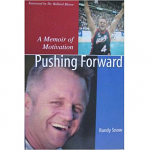 Randy Snow Pushing Forward: - Divided into three sections, this book offers extremely valuable insight on Randy’s childhood, injury, and rehab, and then his wheelchair sports career. The book also throws light on his personal perspective of living life from a wheelchair. Wheels of Fire Video: - This movie delivers a simple message: "Don¹t give up, and never give in. If you can¹t ever lose, then you won¹t ever win." A new breed of paraplegics and amputees crank up their mountain bikes, race trucks, land sails, and big wall climbing gear in a quest for new barriers to break. Whether you are a new customer or someone who has been with us for a while, we guarantee satisfaction. We have spent more than 25 years in the business helping people find the appropriate Wheelchair Books & Videos at the lowest prices, as well as wheelchair accessories, wheelchair parts, and wheelchair cushions, we continue to lead the industry! We are capable of beating any competitor's advertised price, just call! Our customer service staff has over 50 years of experience, plus over 90 years of combined wheelchair use experience. We look forward to working with you!